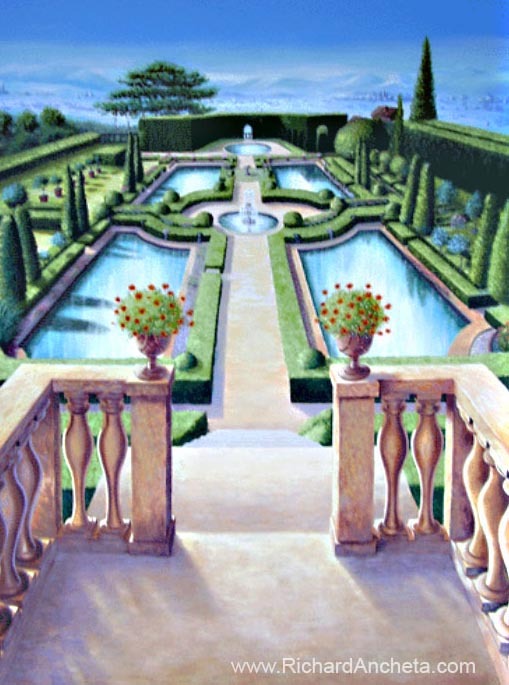 Tuscan Terraces and Italian Garden, Trompe-l'œil Mural 73"x 55"
Our client choose a Tuscan motif, an Italian design style, the decor, elements, and structures generally follow an Italian heritage decorating theme. The gardens almost always exhibit some form of statuary or fountain, huge pools and river beds. And we create an antique balcony, rustic look balusters to where protrude the illusion of trompe-l'œil, to view the classic and majestic gardens, river and architectures of Tuscan. Tuscany (Italian Toscana) is a region in central Italy, bordering on Latium to the south, Umbria and Marche to the east, Emilia-Romagna and Liguria to the north, and the Tyrrhenian Sea to the west. It is often regarded as among the most beautiful parts of Italy. 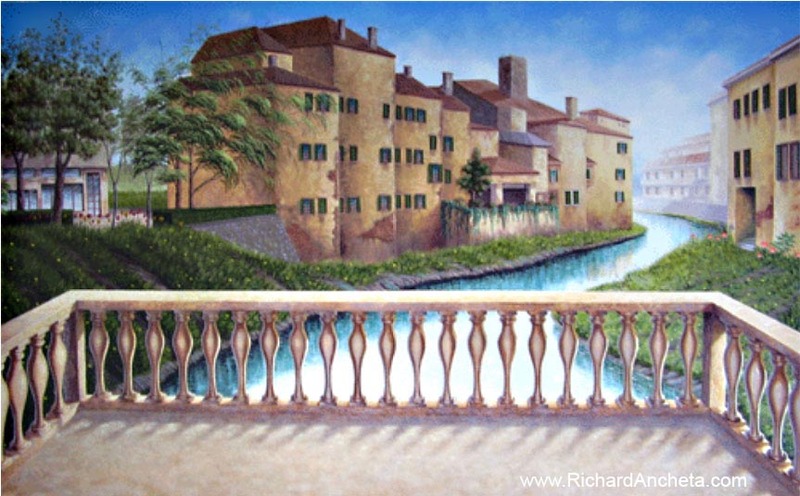 Tuscan Terraces and Italian Riverview, Trompe-l'œil Mural 139" x 82"
Tuscany was the birthplace of the Italian Renaissance, and its artistic heritage includes architecture, painting and sculpture, collected in dozens of museums, the best-known of which is the Uffizi and the Bargello in Florence, but also in many other towns and cities in the region. Tuscany was the birthplace of Leonardo da Vinci and Michelangelo, known for its striking countryside and medieval and Renaissance towns and cities.